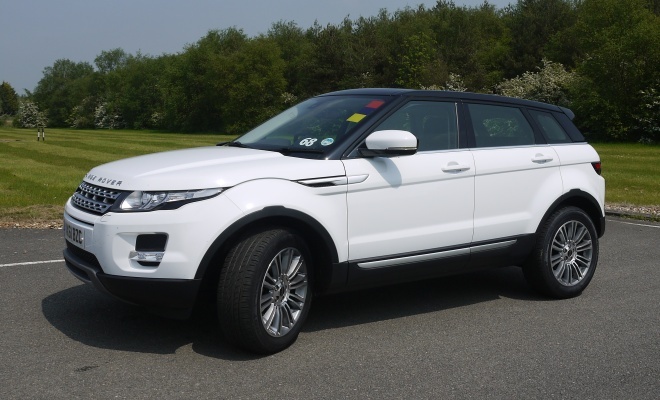 If I’m honest, I can’t say I like the much-celebrated style of the Range Rover Evoque. The original Range Rover was a remarkably elegant design, partly due to its deep windows that accounted for almost half the height of the body. And that balanced design, with its flat roof propped up on slim pillars, was functional as well as aesthetic – being able to see out in all directions is as handy when crawling over rocks as it is on a busy high street. The Evoque is not nearly so elegant, sadly. It may be purposeful, striking and concept-car bold in its proportions, but it’s not remotely harmonious or graceful. And as I climb aboard I harbour concerns about seeing out of its narrow slit of a glasshouse. I needn’t have worried. Visibility to the rear is pretty dreadful, but in other directions it’s tolerable (although entire cars can hide behind the chunky door mirrors at junctions). Plus, there is the option of a Surround Camera System, which provides a variety of views from low down around the car through the central eight-inch touchscreen. The interior style seems a lot better judged than the rakish sheet metal. The surfaces are uniformly chunky but attractive, and the materials all feel properly first-rate. I start out with a two-wheel-drive model, which comes with a 150bhp 2.2-litre diesel eD4 engine and a 6-speed manual gearbox. There’s no automatic option unless you upgrade to four-wheel-drive, and prices start from £28,695 for the most basic Pure trim level. On the challenging simulated B-roads of Millbrook’s hill route, the front-wheel-drive Evoque feels compact, chuckable and surprisingly brisk. The 0-62mph time doesn’t sound particularly fast at 11.2 seconds, but with plenty of grip and firm lateral suspension I find I can sustain an impressive pace through bends. It takes less than five minutes to feel at home in the car, an acclimatisation process helped by well-weighted controls and superb seats. 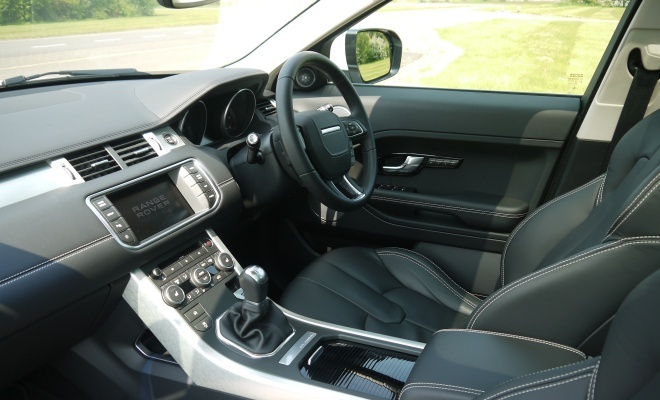 At high motorway speeds, with the transmission slotted into a leggy sixth gear, the Evoque proves serene and steady, with much less engine and wind noise than expected. 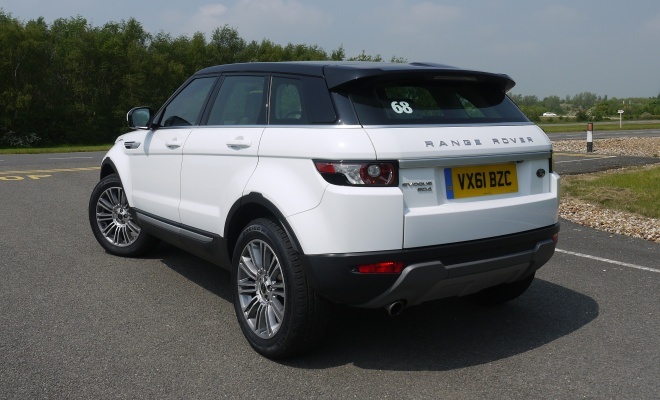 When the Evoque design was upgraded to Range Rover status – its LRX concept forerunner was badged a Land Rover – the company clearly worked hard to provide a premium level of refinement. 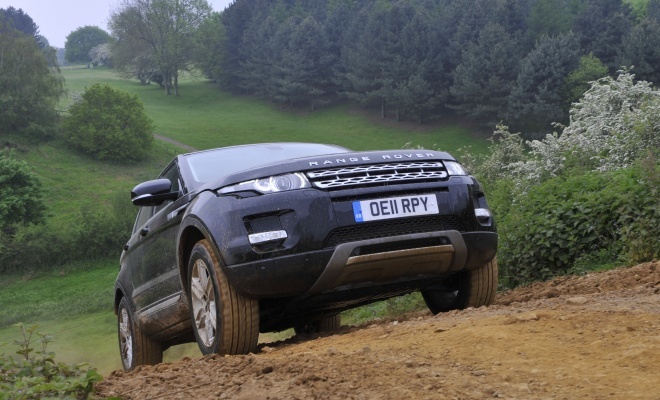 If you never plan to venture off-road, the 2WD model is obviously the Evoque to choose for best economy. If you demand 4x4 looks and their attendant drawbacks in aerodynamics, this is a better bet than most. Engine stop-start helps to achieve a CO2 score of 133g/km and combined cycle economy of 56.5mpg. Land Rover says this level of economy is class leading and that doesn’t seem an idle boast. The eD4 Evoque’s emissions are slightly better than BMW offers with its rear-wheel-drive X1, or Audi achieves with its front-wheel-drive Q3, although it should be noted that both those cars are over a second quicker to 62mph. A similarly slow front-drive VW Tiguan in BlueMotion trim emits 139g/km, and while the front-drive Mini Countryman Cooper SD offers a better combination of emissions and pace than any of the above, it is a substantially smaller car. Still another consideration is that tailpipe gases are only one aspect of motoring emissions. I’ve visited Land Rover’s HQ and interviewed key staff in the past, and I believe the company is sincere in its efforts to improve the sustainability of its operations. It also runs a very worthwhile carbon offsetting scheme to help buyers give back some of what they take. 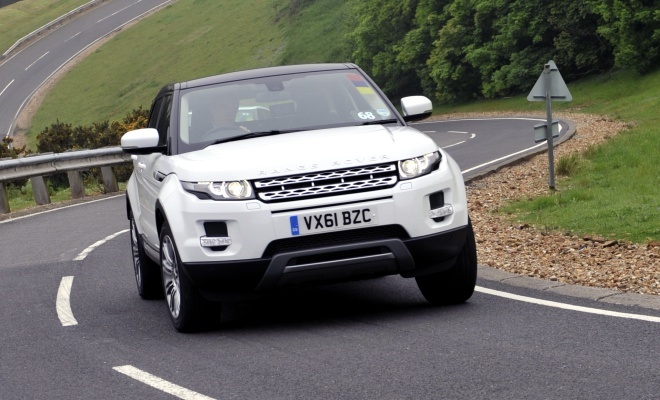 Climbing out of the road-biased eD4 with an unexpectedly broad grin on my face, I switch to a four-wheel-drive Evoque – the black car pictured below, which is an SD4 model in Prestige trim that costs from £38,295. Much the same 2.2-litre four-cylinder diesel as in the eD4 now produces 190bhp and a little bit more torque at 309lbft. It also produces more CO2 – at 149g/km – and uses more fuel, at 49.6mpg on the combined cycle. This particular car features a six-speed automatic transmission, upping the starting price to £39,995 and pushing the CO2 up by 25g/km to an unwelcome 174g/km. This off-the-pace result is disappointing, given that state-of-the-art auto boxes are proving more efficient than manuals. The transmission is controlled via a Jaguar-style cylindrical selector that rises theatrically from the centre console when you switch on. As well as the usual automatic Drive mode, there is also a Sport setting which presumably makes everything more sporty, but as I’m leaving the tarmac behind I won’t be trying this out. Immediately aft of the transmission dial sits an oblong display flanked by a pair of buttons to scroll through the various Terrain Response setups, including highway mode, snow, mud and sand settings. The £615 Surround Camera System is a worthwhile option even if you don’t intend going off-road, as the five cameras – two at the front, one either side and one at the rear – would be a boon in a tight parking spot. When plugging mud, the cameras will guide you unerringly over tricky terrain when the windscreen is filled with nothing but blue sky (assuming the five lenses aren’t plastered with goop). You can set the system to show just one camera view full-screen, or a pair side-by-side, or all five in little boxes. Even on ordinary all-weather tyres, the 4x4 Evoque makes light work of the off-road course, although admittedly the ground is relatively dry. I take a steep sandy incline at crawling pace but it proves no bother at all, with the transmission set for sand the traction control steps in promptly as individual tyres lose grip on the friable surface. The four-wheel drive system is a full-time setup, continuously varying the torque sent to the front or rear using an electronically-controlled central coupling. Switching to mud-and-ruts mode, I follow a plunging, lumpy and curving descent that quickly turns scary and hard to control – until I’m reminded that Land Rover’s excellent Hill Descent system only works if I take my foot off the brake. It feels horribly unwise, but stepping away from the pedals hands the descent over to electronics much smarter than me and my clumsy feet. Control is quickly restored and with a few frantic twirls of the wheel I reach the bottom of the slope much less ruffled than I left the top. The Evoque doesn’t have sufficient axle movement for really tough and rocky routes, but it is sure-footed over quite challenging terrain – where the vast majority of owners won’t ever dream of venturing. I approached the Evoque with some negative assumptions – presuming it was a style over substance car that I’d end up despising. But from the driving seat it feels both capable and likeable. It isn’t cheap, but it feels special. It isn’t really green, but it is better than most rivals. Taken in context – whether you like that context or not – it’s a very good car.